The struggle of the Ukrainian trade unions with the global corporation ArcelorMittal continues despite a day of farce and delay in an ongoing court case against the workers. A court case has been initiated in an effort to derail Ukrainian trade unions dispute with ArcelorMittal Kryviy Rih. The latest court hearing took place on 27 August in the District Administrative Court of Kyiv where despite protests by the leader of the Independent Miners Union of Ukraine Myhailo Volynets, and the Social-Democrat MP Serhey Kaplin it was decided to hold the hearing behind closed doors. The court has decided now to delay judgement until another hearing on 18 September. Volynets made a poweful address to the court defending the unions campaign, challenging the two faced conduct of ArcelorMittal and praising the international solidarity with their struggle from Labour. What is happening is Ukraine is of importance to the international labour movement, it is a major struggle involving ten trade unions and both trade union federations in Ukraine. The unions at the giant ArcelorMittal plant in Kryviy Rih are demanding investment in equipment, improvements in safety at work and after seeing a cut in their real wages, a living wage of 1000 euros. The trade union followed the set procedures in Ukraine and in order to engage a lawful trade dispute, they held a conference of the workers involved – the labour collective. Despite union busting efforts of the company to disrupt the conference it has a mass attendance. 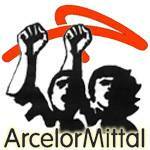 The unions entered in to negotiations with ArcelorMittal involving the National Mediation and Reconciliation Service. On 4 May, representatives of the employer ArcelorMittal and trade unions signed an agreement on the establishment of a conciliation commission, and also agreed to initiate conciliation procedures. The Court continues to serve the interests of the employer against the Ukrainian trade unions – above the court on 27 August. These constant delays are a deliberate effort to block the progress of the Ukrainian trade unions campaign. The actions so far have only provoked anger amongst the Ukrainian trade unionists, which are determined not to have their campaign shackled. Labour movement activists of the Ukraine Solidarity Campaign held protests at ArcelorMittal Offices in London and Newport, and Labour Party MP Lloyd Russel-Moyle called for solidarity with the Ukrainian trade unions in the Early Day Motion he has submitted to Parliament – Early Day Motion 1412 . The Ukrainian trade unions are facing a global corporation – it is time for the international labour movement to join them in solidarity. On 16 May, the workers of the ArcelorMittal railway workshop came out in support of the workers of Ukrzaliznytsia, the state-owned Ukraine Railway, who have been on strike to demand the creation of safe working conditions .